Come and enjoy the spectacular views under some of the world's darkest skies! 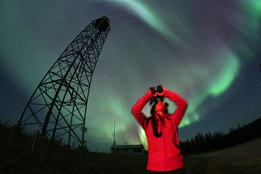 Thebacha & Wood Buffalo Astronomical Society (TAWBAS) is a non-profit NWT society that was established in September 2011 in Fort Smith, NWT. It is a family oriented organization dedicated to making astronomy interesting and fun for everyone. TAWBAS's outreach activities are designed to promote awareness of astronomy, our spectacular skies and the universe around us. Our regular meetings may start with a presentation, demonstration or even a video or Skype conversation on a topic of interest to amateur astronomers. Weather permitting we may also include a recreational star gazing observation session afterwards. Membership in the Society is open to anyone with an interest in astronomy. It may be your first viewing of the night sky through a telescope, a desire to learn about the stars and constellations or, networking with other astronomers. We WELCOME all and encourage you to join us at one of our meetings!